The post split fixtures for the Danske Bank Premiership have been announced. 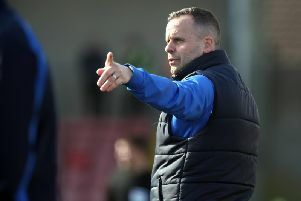 The Northern Ireland Football League Premiership Management Committee has confirmed the post-split fixtures for the Danske Bank Premiership. The fixtures are based on the current league positions to assist clubs with ticketing, match planning and promotion of the end of season fixtures. Premiership leaders, Crusaders face title rivals Linfield at Windsor Park in their first post split fixture on April 8th. The Crues, who are currently seven points clear of the Blues must then visit third placed, Cliftonville at Solitude the following weekend, April 15th. April 8th: Section A - Linfield v Crusaders; Coleraine v Cliftonville; Glenavon V Ballymena United; Section B - Ards v Dungannon Swifts; Ballinamallard United V Glentoran; Portadown V Carrick Rangers. April 15th: Section A - Cliftonville V Crusaders; Ballymena United V Linfield; Coleraine V Glenavon; Section B - Dungannon Swifts V Glentoran; Carrick Rangers V Ards; Portadown V Ballinamallard United. April 18th: Section A - Crusaders V Coleraine; Linfield V Glenavon; Ballymena United V Cliftonville; Section B - Ballinamallard United V Dungannon Swifts; Ards V Portadown; Carrick Rangers V Glentoran. April 22nd: Section A - Ballymena United V Crusaders; Coleraine V Linfield; Cliftonville V Glenavon; Section B - Dungannon Swifts V Carrick Rangers; Ballinamallard United V Ards; Glentoran V Portadown. April 29th: Section A - Crusaders V Glenavon; Cliftonville V Linfield; Coleraine V Ballymena United; Section B - Dungannon Swifts V Portadown; Glentoran V Ards; Ballinamallard United V Carrick Rangers.